It's happening, everyone! Now that I'm over the nerves of knowing that my parents, my two dogs and four other humans are reading my NFL picks every week, I've settled in a got an above .500 week under my belt. Can I keep it up this week? Let's find out. Atlanta is 30th in the NFL in DVOA defensively, but Tampa Bay is one of the few teams that won't make the Falcons pay for it. The Schiano Men are behind every team but Jacksonville in yards per game, points per game, and are 30th in passing yards per game. The Bucs blew a 15 point lead to the Dolphins last week, and managed to just pull the game out against a team who lost 40% of its offensive line. The Jets have alternated wins and losses in every single one of their games this season. Every other week they look like world beaters, then look like a JV squad the rest of the time. In their last game, they manhandled the Saints. This week, EJ Manuel will throw for four touchdowns against them, because Jets. Reports indicate that the Steelers are a mess right now, to the point where Ben Roethlisberger has had to come out and deny it. Surely that's good for a struggling team. Only five teams in the NFL average fewer rushing yards per game than the Steelers, whose -11 turnover differential is the AFC's worst. With that said, Nick Foles has been electric for the Eagles over the last few weeks. The Eagles offense is ranked fifth in DVOA and first in DVOA with their rush offense. Against a Washington defense that is allowing more points than every team not named the Jaguars, he will get the job done. Do the Dolphins have two fifths of their offensive line back after a bullying scandal that has rocked the league to its core? No? Okay. San Diego's offense is ranked third in DVOA, while their defense is ranked dead last. This pick is based primarily on their distinct lack of racism in the locker room. 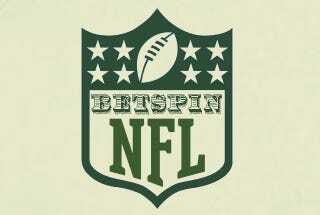 If you'd said that majority of bettors would be on a Josh McCown led Bears team against the defending Super Bowl champions, I would have said "well, after the Ravens overpaid for Joe Flacco, I guess that doesn't seem so crazy." Baltimore is 30th in the NFL in rush yards per game, 29th in total yards per game, and 17th in passing after, again, paying Joe Flacco all that goddamn money. Offensively, the Ravens are 29th in DVOA. Money well spent! In the last 13 games between these teams, the favorite has covered once. When Brandon Weeden hasn't started this year, the Browns are 5-0 against the spread. In the yards per play department, nobody has been better than the Browns defensively. Also, the Bengals have been playing close games as of late, coming off of two straight overtime games. The Raiders have been struggling as of late, but let's not give too much credit to the Texans here. They've lost seven straight games straight up, and they've allowed fewer than 27 points just three times this season. Both teams are averaging fewer than 19 points per game, so to lay nine points in this game just seems foolish. This line is somewhere between 7.5 and 8.5 in most places, but shoutout to the LVH for hooking me up with nine points here. Arizona hasn't been this big a favorite since 2009, but the Jaguars have been historically bad this season. All eight of the Jagwires' losses this season have been by double digits. I know, Mike Glennon covered in Seattle the last time the Seahawks played there. But Christian Ponder is hurting, and Seattle's top ranked pass defense as far as DVOA goes will show him no mercy. If you're still picking against the Saints at home, you really deserve to just lose all of your money forever. The Saints have covered 14 straight games at home under Sean Payton. With Colin Kaepernick making Niners fans long for the days of Alex Smith, and the Saints only giving a field goal here, that streak shall continue. The Giants' number eight DVOA defense takes on Scott Tolzien in a game that can move the Giants to within one game of the NFC East. Regardless of how pathetic and depressing that sentence makes me feel, there's no way that the Giants find a way to screw that up. After all, isn't it obvious that the Giants are going to come back, win the division, run through the NFC and win the Super Bowl over Peyton Manning in Giants Stadium? Seems pretty obvious. I'm not saying that the Chiefs are going to win straight up, but this game will be close. I refuse to believe that Ron Rivera is going to outcoach Bill Belichick on Monday Night Football. I don't care how ignorant that sounds, I just won't believe it until it happens.